I began this project three years ago, back on February 16, 2009. Since I began, many others have joined in on the meme. I am thrilled that this meme I started has inspired so many to transcribe their family history documents. Why do we transcribe? I provide my three reasons in the linked post. You may find others. 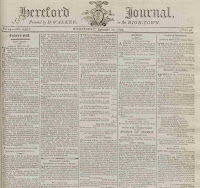 I was informed that the British Newspaper Archive was providing 30 free credits for new registrants. 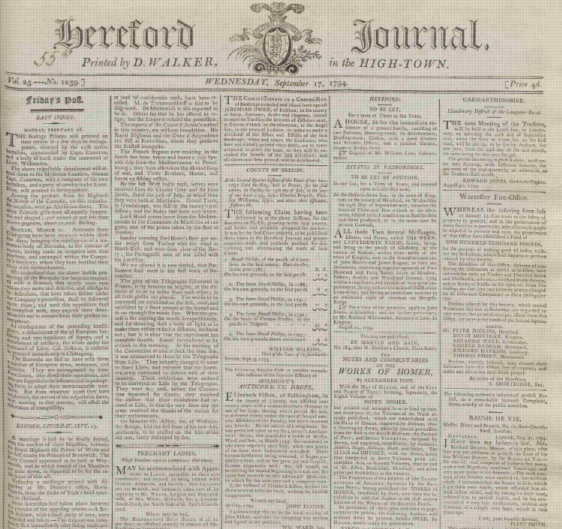 Their database is free to register, and to search, but to view the newspaper pages one must spend 5, 10 or 15 credits depending upon the age of the newspaper, and whether it was a black and white, or color scan. I found two newspaper articles with information on potential relatives, and spent 15 of the 30 credits. They have a range of subscription packages for when the 30 credits run out. (The cheapest is a 2-day 500 credit package that costs £7 or approximately $10. The most expensive is a 12-month unlimited credit package for £80 or approximately $120.) I'm not likely to purchase more than a 2-day package, as I don't think there's going to be much there for me right now. The following authentic instance of perfect Relief, in a remarkable Stomach Complaint, seems worthy of the public attention. 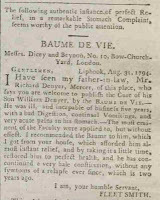 I have seen my father-in-law, Mr. Richard Denyer, Mercer, of this place, who says you are welcome to publish the Cure of his Son William Denyer, by the BAUME DE VIE.—He was ill, and incapable of business five years, with a bad Digestion, continual Vomitings, and very acute pains in his stomach. – The most eminent of the Faculty were applied to, but without effect. 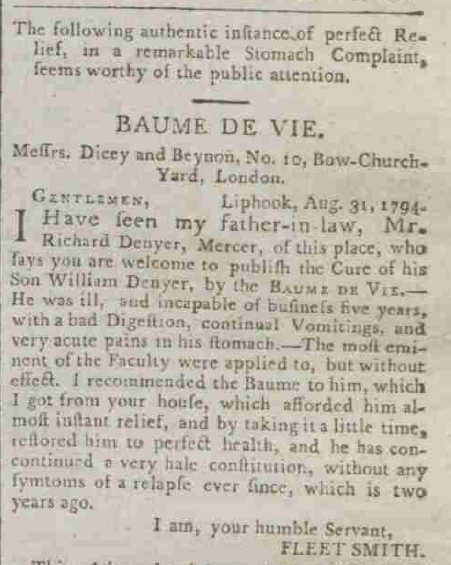 I recommended the Baume to him, which I got from your house, which afforded him almost instant relief, and by taking it a little time, restored him to perfect health, and he has continued a very hale constitution, without any symptoms of a relapse ever since, which is two years ago. 2) My 3rd great grandfather was named William Denyer. Is this him? Or is he related? My 3rd great grandfather was born in approximately 1770, and would have been 24 at the time of this clipping. Some online family trees have him born in 1763 to a Robert Denyer, though his marriage allegations dated 1791 clearly state he was 21 years old at that time, so I suspect a different William Denyer was born to Robert in 1763. 3) A websearch indicates that William and Richard Denyer, and Fleet Smith were witnesses to the will of an Edmund Bettesworth. Interesting post. I have Denyer's from Bramshott, Liphook Hampshire & Lurgershall Sussex. Will look at the files.....have you posted more Denyer details so we can compare? You can read all my posts on my Denyer line by following the "Surname: Denyer" label at the bottom of my post. However, most of the posts relate to my line's activities after immigration to the States. Hi, I came across your page because I have been trying to figure out what exactly is in "Baume de vie." It is actually remedy my grandmother (she passed a long time ago though) used ever since I was a child. We also used it for upset stomach and it would given instant relief. I've been searching for all the rememdies she used when I was a kid and baume de vie is the one remedy I have not been able to get much information on. Please let me know if come across any baume de vie material. Thanks.